Before I forget, a local blogger recently took a little trip down to NYC, and she gives you a little walking tour of its holiday loveliness, in case you’re pondering a visit. Her blog is Just One Foot. For those of you who read about my rice debacle, I thought that I’d give you a Paperwhite Update. Here they are! Pretty, right? The ribbon is to keep them together and upright, because they’re very tall. They’re also quite fragrant. 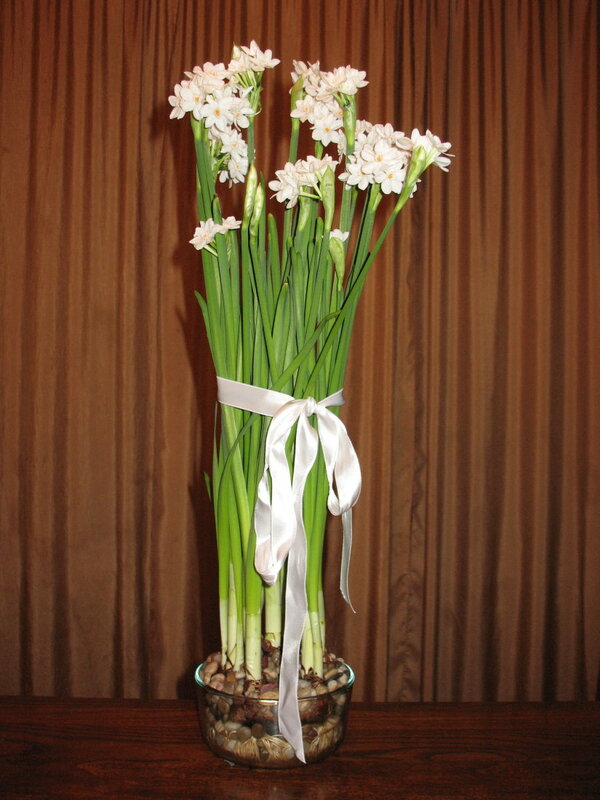 Which is too bad, because I just don’t like the smell of paperwhites. In fact, it’s been a debate in the household. 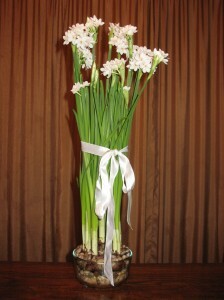 For example, I would prefer to smell silicone sealant than paperwhites, but Cute W thinks that’s crazy. Nevertheless, he brings a scented Christmas candle along when he’s in the same room as the paperwhites, presumably to ward off the scent. Today M declared that the flowers smelled like cauliflower. That seemed far-fetched to me. J thought that was wrong, too. She knew what they smelled like. “They smell like delicious cheesiness!” she declared. Now that, I understood. It was because I was making Spicy Cheese Sticks. They’re based on a recipe that my Mom found in Southern Living magazine. 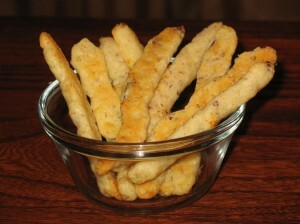 They are super-delicious with a glass of wine. Yes, indeed. Anyway, I vary the recipe a bit. The first time I tried to make them myself, I accidentally doubled the cheese. This was even more fabulous, but several of them dissolved into a puddle of oil. Now I overdo the cheese by maybe 1/3 cup. I also change the nut delivery technique, because I’d rather have chopped pecans scattered throughout instead of pecan halves on top. Besides, the pecan halves on top contribute to The Problem With This Recipe. The problem, if you follow Southern Living‘s recipe, is that you end up with these little biscuits that look like cookies. Which doesn’t seem like it would be a big deal, except that it’s tough to convince people that they aren’t cookies. I took them to a holiday party and set them on the appetizers table with a little name tag, and someone tossed aside the tag and moved them to the dessert table. And even if you tell someone ahead of time that it’s not a cookie, it almost seems like people are simply not emotionally prepared for their non-cookie-ness. The shape and texture sends some sort of signal to people’s brains so that, when no sugar is detected, their subconscious is convinced that Something is Horribly Wrong. So this year, instead of doing biscuit shapes, I measured out scant teaspoons of dough, then rolled them into 4-inch long worms. I also like to add a final dusting of half-and-half cayenne and salt, although I like salty & spicy. Then I baked them for about 7 or 8 minutes. All that rolling is more labor-intensive, but at least it’s mindless. And these are super-yummy, and a little bundle of these tied with a ribbon make nice change of pace from the tin of cookies (although I absolutely respect the tin of cookies, believe me). These are, of course, even more delectable right out of the oven. I am going to make these for Kira and Sidi’s baby shower. I was going to make the cheese biscuits but now it will be the cheese straws. Thanks for the idea.